Classical Art Studios creates hand painted masterpieces for both residential and commercial spaces. Accomplished artists, Randy Ingram and Brian Townsend each bring more than 20 years of painting experience to their clients. As a result of their combined painting ability, their completed works have an extremely high degree of finish and realism. Randy studied at Rutgers University and duCret School of Fine Art, while Brian studied at Kean College, duCret School of Fine Art, and the National Academy of Design. Over the past two decades, Brian’s skilled hand has resulted in his portraits and still life paintings becoming prized gallery collectables. 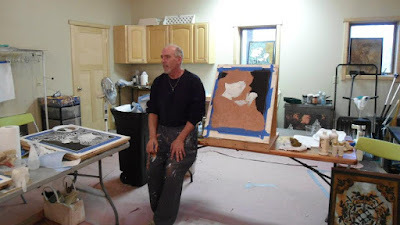 In addition to collaborating with Brian on large scale oil paintings, Randy has created numerous prosperous companies including Classical Art Studios, Fauxtastic Wall Finishes, and All American Painting Pros. Both artists are award winners for ‘Best Mural’ and ‘Best Trompe L’oeil’ in Fauxacademy’s National Decorative Arts Competition. The duo is nationally published, including articles in: Faux Effects World, The Faux Finisher Magazine, The House That Faux Built, Design NJ, New York Spaces, The Journal Magazine and they have also appeared on the Style-X Television Series. Exhibitions of Randy and Brian’s work have been displayed at: The National Academy of Design, New York, NY; The National Arts Club, New York, NY; The Salmagundi Club, New York, NY; Vero Beach Art Museum, Vero Beach, FL; New Jersey State Art Museum, Trenton, NJ; Swain Art Galleries, Plainfield, NJ; Miami Convention Center, Miami, FL; and Tampa Bay Convention Center, Tampa, FL. Their work has been procured nationally in private and corporate collections including: Nasso Movie Studios, New York, NY; Baltusrol Golf Course, Springfield, NJ; Carrier Foundation, Belle Mead, NJ; Church of Holy Comforter, Vienna, VA; Century Sports, Lakewood, NJ; Stage Left, New Brunswick, NJ; New Brunswick Municipal Building, New Brunswick, NJ; Saint Agnes Church, Highlands, NJ; Watermark Properties, Vero Beach, FL; Cheney Brothers Transport, Jupiter, FL; Eagle Oaks Golf Course, Farmingdale, NJ; Design Source, Holmdel, NJ; Atlantic City Art Center, Atlantic City, NJ; Elite Home Sculpting, Freehold, NJ; M.C.C. Corporation, Murray Hill, NJ, and the Church of the Atonement, Chicago, IL. Educators in fine art and inveterate seminar speakers, Brian and Randy have lectured and taught in places such as duCret School of Fine Art, Plainfield, NJ; New Jersey Center for the Visual Arts, Summit, NJ; Faux Effects International, Vero Beach, FL; The Kelly S. King Academy, Inc., Omaha, NE; The Faux Academy, Las Vegas, NV; Somerset Art Association, Bedminster, NJ; The Hudson Valley Artist League, Beacon, NY; and Schwartz Design Showroom, Metuchen, NJ.